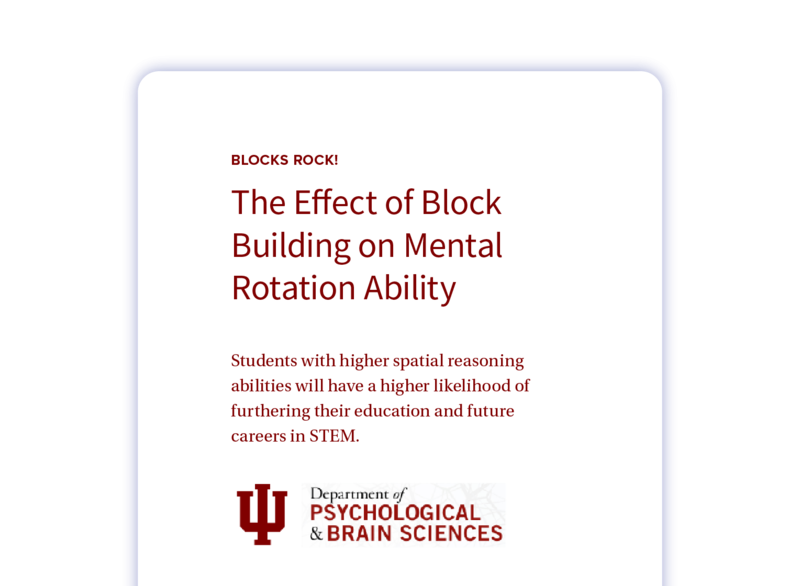 Researchers with Indiana University studied the impact of structured block building and board game on spatial processing. Using Blocks Rock! and Scrabble, researchers found that block play has a significant impact on mental rotation performance. Learn about five women STEM pioneers in in this first installation of our STEM Role Models series! Read through five current articles that will excite you about the current state of STEM learning and give you a glimpse of its future! We're highlighting awesome STEM careers that inspire kids! Learn more about what meteorologists do, how to become an meteorologist, and more! Discover how Blocks Rock! is bridging generations and activating brains at the Louisville Masonic Community. Discover 7 ideas for keeping fun STEM learning going through the cold winter months! Bridging Generations: The Louisville Masonic Community & Blocks Rock! There's something extraordinary happening at Louisville Masonic Community, and as you’ll see, it includes Blocks Rock! Our 2018 STEM gift guide is here, and we have some great picks that are sure to lead to fun and engaging learning! We're highlighting awesome STEM careers that inspire kids! Learn more about what paleontologists do, how to become an paleontologists, and more! It's time to get spooky and have fun using these STEM activities with a Halloween twist! Can block play really improve STEM skills? How does that even work? And what is "competitive structured block play"? We're giving you all the answers below. Bring the whole family together with these fun activities that are also full of learning moments! We're highlighting awesome STEM careers that inspire kids! Learn more about what astronauts do, how to become an astronaut, and more! Check out fun ideas on how to make sure your classroom is organized, decorated, and perfectly stocked for the new school year. Our Indoor STEM Activity Guide gives you learning inspiration from some of our favorite bloggers. To celebrate our new partnership with Toys with Intent, we interviewed the website's founder, Kelli McCarty! Read our bucket list of brain-building activities for summer-long, STEM fun! Discover nationwide STEM camps for kids and keep reading to learn about suggestions we have for summer STEM learning. Discover grants for nonprofits that are expanding educational and STEM learning opportunities in your community. One fun way to add STEM learning to children’s days is by using apps that are designed for learning. Check out these nine STEM-related apps! Learn and play this spring break with these fun, STEM ideas for kids! We've highlighted some of the premier locations for STEM learning for kids across the nation. Is Spatial Awareness the STEM Skill Your Child Lacks? Spatial awareness is critical for STEM development. So, what is it and how can you develop it in your child or students? We have the answers. How to Write a Grant for Blocks Rock! Learn about grant writing and discover how you can get Blocks Rock! free for your school, classroom, or afterschool program. Explore three ways to add STEM learning into your elementary classroom. What do you think will happen in STEM education in 2018? Here are our predictions. Fun Gift Ideas for Young STEM Enthusiasts! Find natural ways to encourage your child's curiosity with these fun gift ideas for young STEM enthusiasts! Are Building Blocks Really a Perfect Learning Tool? Learn about research that supports building blocks as an important development tool for social, creative, literacy, and intellectual skills. These bloggers might help you discover new learning activities for your classroom and more! Embrace adventurous learning by taking a look at tiny teachable moments that happen in your everyday activities. In this post we focus on Fall! Engage children in learning by creating lessons that use multiple senses and work with multiple learning styles. Did you know that physical movement has been shown to have scientifically proven impacts on academic performance? It's true! Read our blog post to learn more! Parents and teachers alike can work together to cultivate a great environment for children of all backgrounds and learning styles. See how! Support your child’s return to school than by starting the year off right with good nutrition and sleep. Read our practical suggestions to make that happen. We're summarizing four recent articles or studies on child brain development so you can feel helped, inspired, or challenged to put the news into action. Looking for summer day trip ideas that can encourage STEM learning? Check out some of our suggestions! Looking for fun ways to keep kids’ brains active at home this summer? Check out our list of ideas! Structured block-building games improve spatial abilities in children to a greater degree than board games. A study examines how electronic playthings impact the way babies engage verbally with their parents, which is crucial for cognitive development. 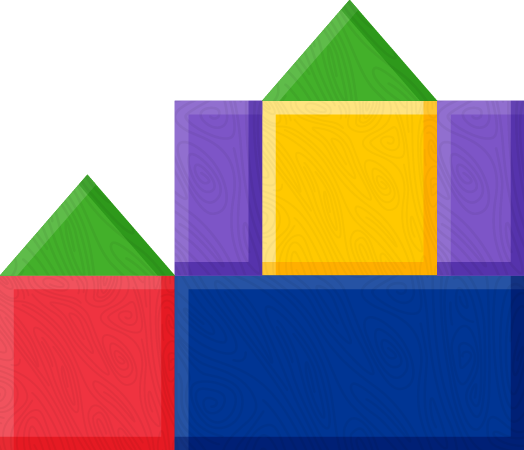 Blocks: great learning tools from infancy through the primary grades.